There is always something exciting happening at NNEMAP! Read below to learn about past, present and future events and programs. 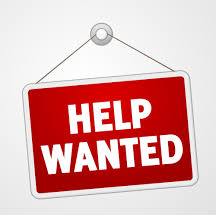 NNEMAP Food Pantry is currently seeking to fill two part-time positions. Please continue reading for position descriptions and application instructions. The ideal candidate will have experience in a retail, grocery or food service environment. Computer literacy and customer service experience is required. Food safety training will be provided. Must be available all mornings during the week including Saturdays. Must be able to lift up to 50 pounds repetitively. This position will be scheduled at least 30 hours per week. Rate of pay will be $18.00/hour. Applicants will be subject to a background check. Clean driving record required. Having access to a truck or SUV would be helpful. Interested candidates should submit a resume to director@nnemappantry.org by April 19, 2019. Questions can be answered by calling 614-297-0533. This position will be scheduled 25 to 30 hours per week. Rate of pay will be $15.00/hour. You Can Help NNEMAP Knock Out Poverty! We’ve joined the fight against poverty with @United Way of Central Ohio, and we need you on our team! 1 in 3 people in central Ohio lack the income to meet their basic needs. But you can be part of the solution. Join us and @United Way of Central Ohio in the fight against poverty by supporting NNEMAP Food Pantry in a fun and exciting “March Madness”-style fundraising tournament. NOW through March 10, your donation gives NNEMAP Food Pantry a strong start in this year’s Knock Out Poverty bracket challenge as we compete for a $200,000 prize pool! Get in the game and help us #KnockOutPoverty in our city. All you need to do is CLICK HERE TO DONATE! 100% of your donation goes to NNEMAP Food Pantry. Bracket standings go LIVE on March 11. More donors + more donations = more prize money for NNEMAP Food Pantry! The best part? No matter who wins, we ALL win! THANK YOU for supporting our quest to win the #KOPChallenge! A Capital Christmas Gift for NNEMAP! NNEMAP Food Pantry has been experiencing the “joys of ownership” since moving into our first permanent facility in 2015. Our humble abode at 677 E. 11th Avenue is definitely a step up from our church basement days. Still, after living here for a few years, we noticed a few things could use a little sprucing up. Thanks to the generous support of the Richard H. and Ann Shafer Fund, NNEMAP was awarded a $50,000 capital grant from The Columbus Foundation. We’ve got a few items that need upgraded and a couple of things that are going to make our service to the community even better. 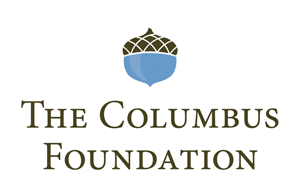 Like so many other organizations in Central Ohio, we are extremely grateful and appreciative of the assistance from The Columbus Foundation. Thank you for being such a tremendous asset to the community and a great friend of NNEMAP Food Pantry! Nothing like an early Christmas present! Do you have some end-of-year giving in mind? Don’t hesitate–you can DONATE NOW via our secure PayPal portal on our website. Thank YOU for your generous support! Come See the NNEMAP Dance Craze! Hazel Black, NNEMAP Food Pantry volunteer and Ohio State dance major, has focused her senior project around her experience at NNEMAP Food Pantry. We’re not going to lie here–we’re pretty flattered by all the attention! 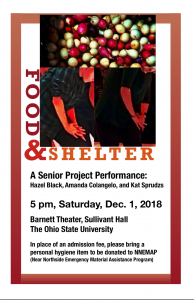 Hazel’s artistic interpretation of that experience, “Food and Shelter,” will be making its world debut this Saturday, December 1, at 5:00pm at Sullivant Hall (1813 N. High St. / 43210) on the OSU Campus (best parking spot: Ohio Union garage on High Street). Come support Hazel’s work as she celebrates our work in the community. Hope to see you there! PS: The performance is scheduled to conclude by 6:00pm. The football team doesn’t play until 8:00pm, so you can’t use that as an excuse! What’s New? Our Kroger Community Rewards ID! Attention, Kroger shoppers! Just a little friendly reminder for you from your friends at NNEMAP Food Pantry. Do you participate in Kroger’s Community Rewards program? The leading grocery store chain’s generous program distributes millions of dollars annually to schools, churches and other non-profit organizations. In other words, Kroger Community Rewards help provide crucial funds for organizations just like NNEMAP! Signing up is fast and easy. Simply go to the Kroger Community Rewards site and log in. If you haven’t created an account before, you’ll need to enter an e-mail address and password. Complete the remaining required fields, and you will proceed to a “Find Your Organization” prompt. You can type “NNEMAP” in the box or just enter our organization’s ID number: HV073. Then click on the “Search” button. NOTE: our organization ID number changed, but you don’t have to! If you were already enrolled, the system automatically updated to our new info. When your search results come up, click on the “enroll” button when the NNEMAP search results come up. And…that’s it! It is really that simple. You shop, we get a steady drip of needed financial support. What’s not to love? Not a Kroger shopper? Don’t let that stop you from supporting NNEMAP’s mission! Click here to find out how you can help today! As always, THANK YOU for your generous support! info@nnemappantry.org 677 E. 11th Ave. PLEASE NOTE: We will be CLOSED on SATURDAY, April 27 for our volunteer appreciation luncheon. We will re-open on MONDAY, April 29. NNEMAP Food Pantry is an equal opportunity provider. © Copyright 2019 NNEMAP. All rights reserved.